A woman who drove her car into an icy pond Tuesday morning escaped with just some cuts, thanks to the help of a few good Samaritans. The driver's window fogged up, so she tried to pull over, according to Minnesota State Patrol Lt. Tiffani Nielson. Instead, she ended up in a holding pond near a ramp at the intersection of Hwy. 169 and I-494 in Bloomington. The driver didn't realize where she was until water started seeping in, Nielson said. Several passersby stopped to help get her out of the sinking vehicle. One pulled a pallet off a truck and set it on the ice to distribute weight as they got alongside the vehicle. 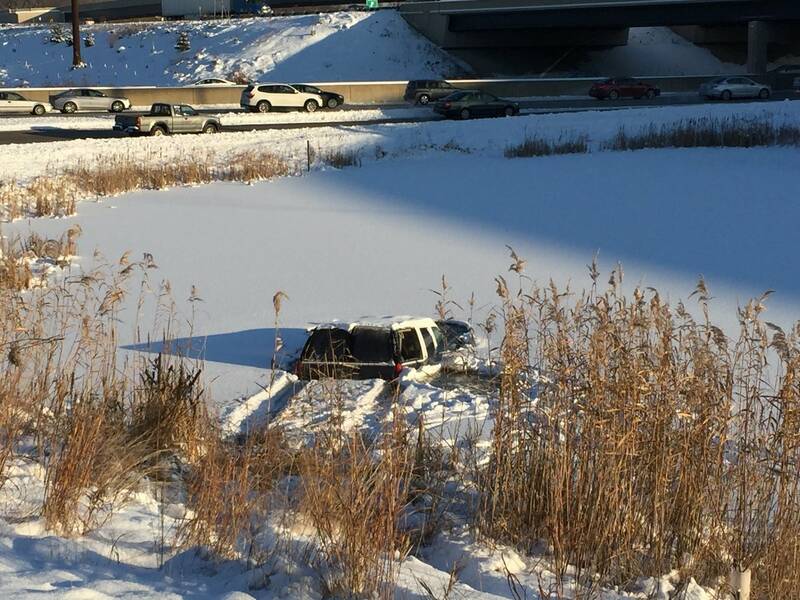 The vehicle had crashed through the ice and was under water almost to the top of the cab, Nielson said. Nielson said the woman smashed a window with a fire extinguisher, but adds other objects would have worked. "You can pull your headrest out and use the prongs from that to break through the vehicle," Neilson said. "If you ever feel your vehicle is going into a body of water you should try to roll the windows down right away." Nancy Lebens is deputy managing editor and evening editor for MPR News.